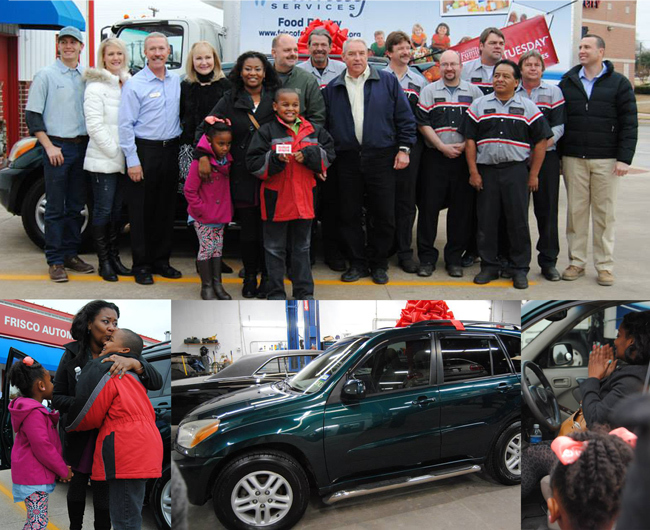 Frisco Family Services Client Receives a New Car Just in Time for the Holidays as a part of #GivingTuesday! Frisco Family Services client Alesia Seraile pulled into Frisco Automotive's parking lot with her sister to get her sister's car a new part. As she was waiting, Charles Haley, owner of Frisco Automotive pulled forward in a green Toyota RAV4 with a giant, red bow on top to give to Alesia. As Frisco Automotive and Frisco Family Services staff and Alesia's family looked on, tears came down Alesia's cheeks as she was shocked to learn she once-again had her own transportation. Alesia is a single mom with two children, a 9-year-old son and a 6-year-old daughter. Alesia has been employed for four years, but recently had to go on medical leave from work. Exhausting all of her paid time off and still unable to return to work, she had no income. During this period of time, her childcare assistance ended burdening her further with the full cost of childcare. With her finances being split between medical bills, childcare and providing a home and nutritious food for her children, she made the tough choice in September to give up her car to have the necessary funds to keep her family in their home and food on the table. She was relying on friends to take her to and from work and to appointments for her children. Frisco Automotive and Frisco Family Services partnered together on #GivingTuesday, a global day of giving back and generosity. This gift will enable Alesia to regain her self-sufficiency, a key component of Frisco Family Services’ mission. "I feel really blessed," Alesia said. "Everything hit one after another after another. Now that I have a car, I don't have to worry about rides. It's awesome; it's a good feeling." Thank you to Frisco Automotive & Transmission owner Charles Haley and his employees who donated more than 40 hours of work to getting the car ready for Alesia. Frisco Automotive also donated a year's worth of insurance and a year of oil changes and maintenance. Photos from this fantastic day can be found here.